I have a mage problem. The first character I ever made was a mage. Then I made Vexxy, an undead mage. Then I made Mynx, a Blood Elf mage. Then I made Snazzie, the gnome. Then I made Zexxie, another Blood Elf mage. That was quite recently actually. But I hit level 35 and got bored. ( I have been having that issue around the 30’s lately.) So, I decided to have a look at what Mynx was up to. She’s been hanging around Orgrimmar for a couple of years, so she had no talent points. All my other Horde characters had up and left the server she was on, so to join her friends, she had to change her name to Myinx. After I got my talents sorted out, I checked what my mount situation was like. Wow! That’s right! 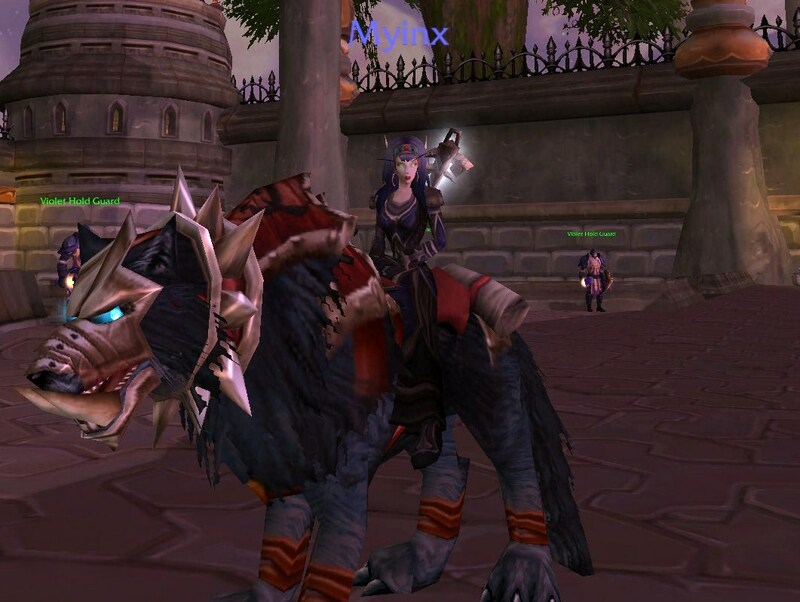 Myinx has the Black War Wolf! Awesome! I spent hour and hours (if not weeks) torturing myself in PvP to get this thing. I quickly bought myself a ticket to Dalaran – paying way more than I should have because I was in a hurry, and started riding around gleefully. I was so excited that I forgot to get myself glyphs till I was level 72! Who cares, right? Vanity is EVERYTHING. Too bad I don’t have time to play her now till NEXT weekend. Boo! You realize, don’t you, that other classes are what people play until they discover mages? I am happy you are liking the mage class. It is one of my favorite, and the one I played with for the last 5 years. That wolf is AWESOME. Love it. Wish I could get one too. Previous Previous post: Congrats to StoneyBaby!